There will also be a $40 (plus GST) cost for the purchase of a dance fan. Contact TomoeArts for details and registration. Spaces are limited! We are offering a 10-session introductory course teaching some of the forms, aesthetics and context of nihon buyoh. You will learn two short dances as an introduction to female form (onnagata) and male form (otokogata). This class is limited to 6 participants because of studio size. 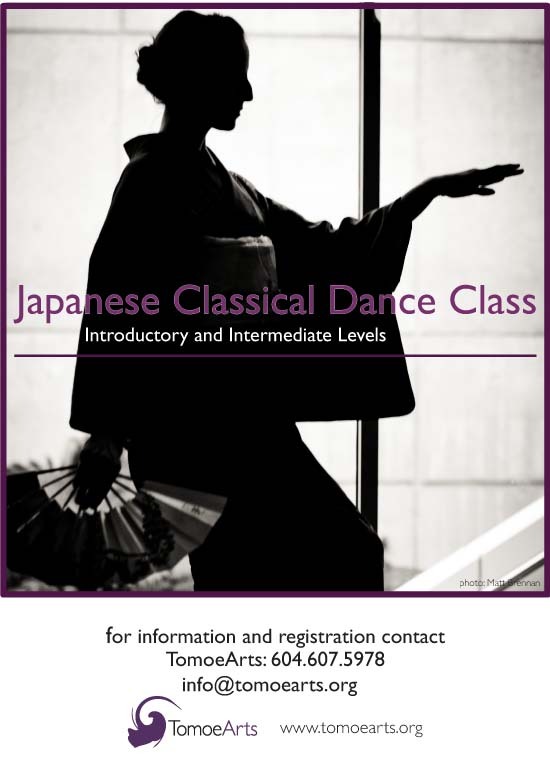 It is open to dancers, actors and anyone interested in Japanese dance or culture. No previous dance experience is necessary. Participants are required to wear tabi (Japanese split-toed socks) or white socks and, if possible, a yukata (cotton kimono). If you have a yukata, but don't know how to put it on - we can teach you! WE ALSO OFFER ONGOING PRIVATE AND SEMI-PRIVATE LESSONS...please call or email us for details. TomoeArts classes are featured in The Georgia Straight. See the article here.